The week is looking to close off on a strong note as US equity futures have been surging in the pre-market with S&P 500 futures indicated to open up by 0.70%. 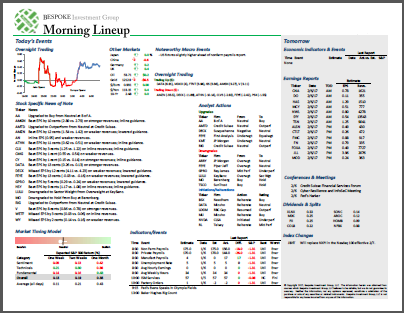 The drivers of this morning’s gains are a cocktail of strong loan growth data out of China, a positive start to earnings season with a big beat from JP Morgan (JPM) and no major misses from the Wells Fargo (WFC) or PNC, and then lastly a big merger in the Energy sector where Chevron (CVX) has agreed to acquire Anadarko Petroleum (APC) for $33 billion in cash and stock. Also, Disney (DIS) is trading up over 6% on its new streaming service which is expected to be unprofitable for years to come! There’s a little bit of everything for the bulls to chew on this morning. 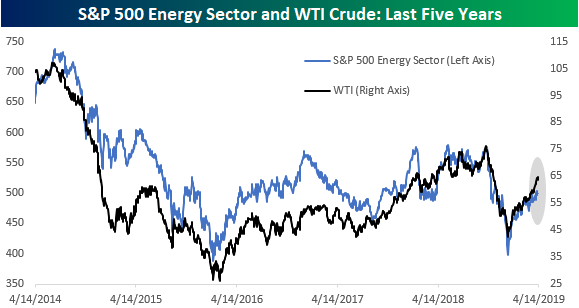 With regards to the Energy sector, there has been some head scratching this year over the fact that the Energy sector wasn’t up more given the surge in oil prices. Today’s deal between CVX and APC would seem to validate that view. Looking at a chart of how crude oil and the Energy sector have traded over the last five years shows that the two have tended to track each other pretty closely. If you look closely at the chart above, you can barely make out crude oil’s recent surge while the Energy sector’s rally has been more restrained. 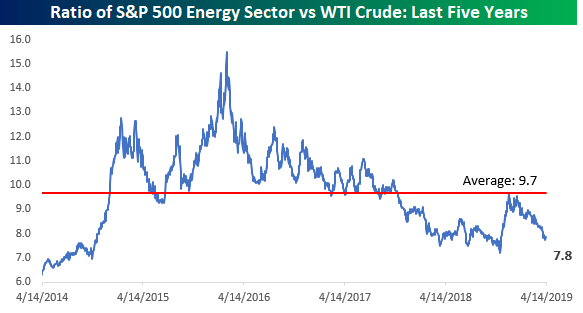 As a result of that disparity, the ratio between the price of the Energy sector to the price of WTI crude oil has fallen to 7.8, which is right near the low end of the range from the last five years and nearly two full points less than the average of 9.7. Granted, it’s a crude comparison (pun intended) and only one piece of a bigger puzzle, but based on where oil prices are trading, the Energy sector looks cheap.